Clear VC is a specialist provider of audio visual communication solutions for a range of sectors including manufacturing, hospitality, education, technology, finance, and government. Headquartered in Manchester, its talented team is highly experienced in delivering Videoconferencing, Audio Visual, IT & Telecoms projects. Since the refurbishment was completed bookings have gone up by 16% and revenue has increased by 27%. The London offices for The Institute of Chartered Accountants in England and Wales (ICAEW), One Moorgate Place, is a beautiful grade-II listed venue in the heart of the city. It has over 20 versatile rooms which can accommodate almost any event or conference, the largest and most impressive of which is the Great Hall. The building comprises two parts, both of which fall under the Grade II listed building status. One dates from the 19th Century and has its original stained glass windows on display and stunning Victorian ceiling murals in the meeting rooms. This is linked by a marble stairway to the more contemporary building, erected in the 1970s, which contains the Great Hall. 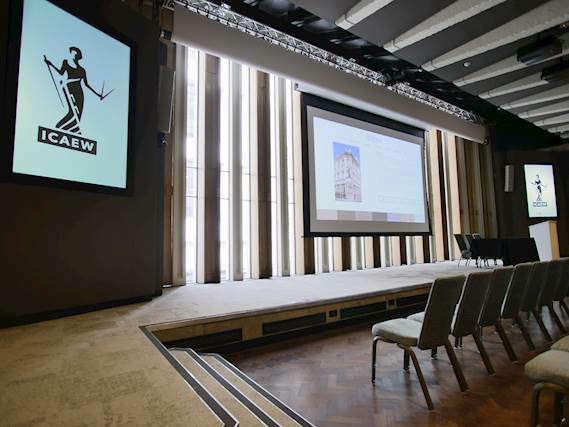 Although a grade II listed building, ICAEW wanted to embrace the technical developments of the 21st Century and provide absolutely the best facilities for its event and conference customers. 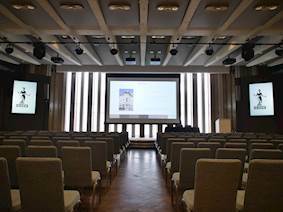 The Great Hall had three old XGA projectors beaming onto a stage backdrop with copper cabling and an Old Cue control system that desperately needed replacing. Tall windows that stand 4m high and span the entire side of the Great Hall, were obscured by the old stage backdrop, which blocked all natural light coming into the room. English Heritage was keen that these, complete with their original wooden shutters, were uncovered as part of the refurbishment but this creates the challenge of an entire wall of windows to project towards. 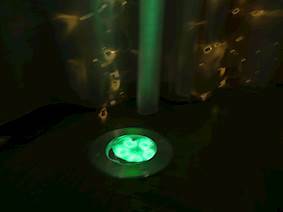 This meant it needed significantly brighter projectors. Martin added: “In designing the space we wanted to give customers the choice of whether they project across the whole 12 metres with the blinds closed or open the blinds and project onto a 5m screen. Due to sheer scale of the works and budget constraints the team needed a staged approach to the installation. Visual communication specialists, ClearVC, which has worked with the ICAEW since 2011 when it implemented a videoconferencing system, installed the first phase in February 2016 - the control system. The AV experts replaced the ageing Cue system with a Crestron AV3 processor with new HDBaseT transmitters and receivers. This gave ICAEW better control over the environment with less concerns over the serviceability of the room. The control user interface was delivered on an iPad using the Crestron App. 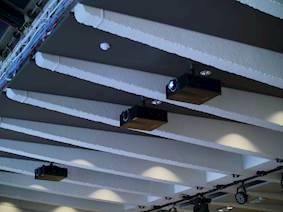 The three old NEC XGA resolution projectors in the Great Hall, which produced dim inconsistent imagery, were replaced with three Optoma ZU650 laser projectors. A further ZU650 was also installed in the Auditorium Council Chamber. Then came the major refurbishment of the Great Hall. In just eight weeks the team replaced the floors, furniture and wall decoration. The old stage with its light-obscuring backdrop was removed and a full makeover with the latest AV equipment, lighting and conferencing facilities were installed. The bank of three ZU650 laser WUXGA ProScene projectors were re-installed to project across a new 12m-wide fast-rolling electric extra-large Gerriets Megascreen. This allows the customer to have the flexibility to show three different images across the three screens or the same content across all. A further 5m-wide electric screen was then installed for customers who want a smaller single projection with the blinds open. This called for an even brighter projector – so the team selected the 8,200-lumen Optoma ZU850 WUXGA laser projector. The Crestron system was programmed to control the projectors over the LAN. The HDBaseT receivers were removed and the built-in HDBaseT input on the projectors receive the signals. Two ZH400UST Full HD laser ultra short throw projectors were installed in portrait mode on both sides of the stage so clients can display either their logo or that of their sponsors during events. These are rear projected so no equipment is on display. Clear VC installed stage and architectural lighting with down lights to give ICAEW and its customers the ability to wall wash colours across the hall using amBX lighting server and Studio Due light fittings. Adrian explained: “This gives a choice of 256 million colours – so whichever colour the customer would like, the whole environment can feel the same. Brands can match their logo perfectly within the environment by taking a single pixel from the logo projected on the ZH400UST projector, and use this as the basis to colour match the room. It’s brilliant! Three Biamp Tesira Forte AVB digital signal processors and a replacement voice reinforcement system were added to accommodate any type of microphone and give event organisers more flexibility. 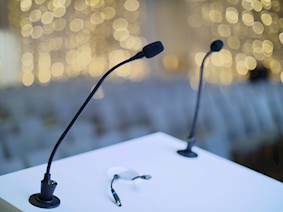 Presenters can stand at the lectern, roam free with a lapel mic or use the goose neck mics for a top table type event. The lectern location can be moved to one of three different positions and can be simply plugged in where the customer wants to use it. Videoconferencing facilities, the last part of the jigsaw, were installed in March 2018 with LifeSize Icon 800 Videoconferencing equipment and Vaddio RoboTrak cameras. Presenters can walk around the hall wearing a special lanyard and the camera will follow the speaker wherever they are, which will then be transmitted through the videoconferencing system. With multiple inputs throughout the room and three locations for the lectern in the Great Hall, a Crestron 16x16 Digital Media matrix allows signals to be switched swiftly and simply. Fibre optic out from this can transmit whatever is being shown in the Great Hall to the auditorium for an extended event or to the Tripleplay server which is then able to broadcast throughout the entire building and even to the ICAEW headquarters in Milton Keynes. 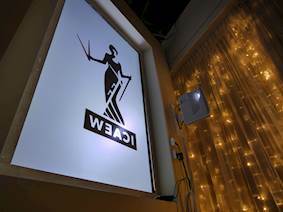 It also connects into the Lifesize Icon 800 videoconferencing system which has a Lifesize Cloud for global deployment enabling ICAEW to broadcast whatever takes place in the Great Hall anywhere in the world, instantly. Adrian said: “We wanted this consistency for users throughout the whole venue. 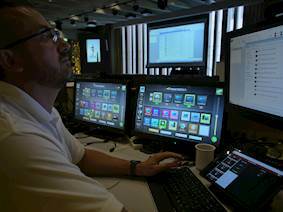 Using Crestron digital media for video switching, control and lighting provides this continuity across all rooms. 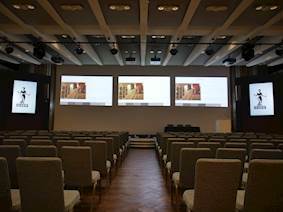 The Great Hall has been transformed into a modern versatile space for events and conferences with state-of-the-art AV technology. • Microphones: Revolabs Exec Elite Wireless lapel mics, roving handheld mics, Shure Table Top Gooseneck Wireless mics, Shure Wired Gooseneck mics for the lectern position. 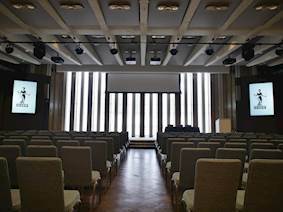 Chartered Accountants’ Hall, which is also known as One Moorgate Place, has a range of facilities that can be used for private events, meetings or even as a place to study. There is a suite of meeting rooms filled with natural daylight and technical equipment, as well as beautiful function rooms available for celebratory events. The historic venue combines elegant features with contemporary style, can cater for up to 600 guests and can be hired for conferences, meetings, weddings, parties, private dining and special occasions.